Grantham Canal Junction is a place on the waterways minor waterways place place on the waterways major waterways place village town city at the junction of the River Trent (non-tidal section) with the Grantham Canal. Stoke Bardolph is on the River Trent (non-tidal section), 6 miles and ¾ furlongs and 2 locks to the east. Meadow Lane Junction (Junction of Nottingham Canal with River Trent) is on the River Trent (non-tidal section), 1½ furlongs to the southwest. Grantham Basin (Infilled) is on the Grantham Canal, 32 miles and 7½ furlongs and 18 locks to the east. It is part of Nottingham. The nearest place in the direction of Stoke Bardolph is Lady Bay Bridge; ½ furlongs away. 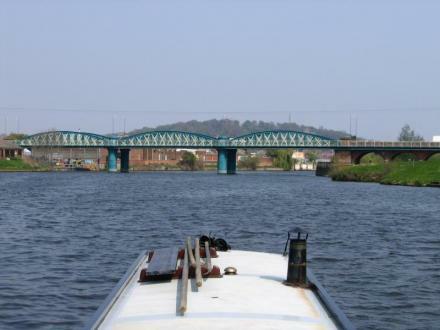 The nearest place in the direction of Grantham Basin is Trent Lock No 1 Footbridge; ¼ furlongs away. 2 Barker Gate, Nottingham, NG1 1JS — 1406 yards to the northwest. Nottingham, NG2 2JY — 887 yards to the southwest. Carrington St, Nottingham, NG2 3AQ — 1118 yards to the northwest. The Unitarian Church, High Pavement, Nottingham, NG1 1HF — 1329 yards to the northwest. 48-52 Canal Street, Nottingham, NG1 7EH — 1340 yards to the northwest. 2 Radcliffe Rd, Nottingham — 608 yards to the south. 20A Carlton Street, Nottingham, NG11NN — 1600 yards to the northwest. Meadow Lane, Nottingham, NG2 3HJ — 315 yards to the west. The City Ground, Nottingham, NG2 5FJ — 283 yards to the south. Bolero Sq, The Lace Market, Nottingham, NG1 1LA — 1365 yards to the north. Colwick Park, Nottingham, NG2 4BE — 1533 yards to the northeast. The Bay, 1 Holme Road, West Bridgford, Nottingham, NG2 5AA — 546 yards to the southeast. Bolero Square, Nottingham, NG1 1LA — 1331 yards to the north. Nottingham — 1241 yards to the northwest. Sneinton — 1304 yards to the north. Nottingham, M7 1 — 1251 yards to the west. Nottingham — 646 yards to the south. Nottingham — 1061 yards to the northwest. 5 Broadway, Lace Market, Nottingham, NG1 1PR — 1400 yards to the northwest. Unit 4, The Hicking Bldg., Queens Road, Nottingham, NG23 — 739 yards to the northwest. Pavillion Rd., Nottingham, NG2 5FR — 299 yards to the south. Meadow Lane, Nottingham, NG2 3HJ — 300 yards to the west. 282-284 Arkwright Street, Nottingham, NG2 2GR — 531 yards to the southwest. Nottingham — 1065 yards to the southwest. Bolero Sq, The Lace Market, Nottingham — 1323 yards to the north. Central Ave., West Bridgford, West Bridgford — 1189 yards to the southeast. 8-10 Castle Wharf, Nottingham, NG1 7EH — 1484 yards to the northwest. Nottingham — 551 yards to the southwest. Nottingham — 155 yards to the south. Nottingham — 1311 yards to the north. Nottingham — 1420 yards to the southwest. Nottingham — 276 yards to the south. Belward St, Nottingham, NG1 1JZ — 1437 yards to the northwest. Pavilion Rd, Nottingham, NG2 5FJ — 264 yards to the south.